Every map is an outdated map. Buildings change, people relocate, and what was accurate a decade ago may mean nothing to someone on patrol today. Which is one reason the Defense Advanced Research Projects Agency is pursuing Fast Lightweight Autonomy, a program designed to teach drones to effortlessly scout and map unfamiliar locations, without the help of GPS or external guidance tools, so that the military can rely on the freshest scouting information possible. For Phase II of the program, DARPA split the task into three parts. One team worked on better flight outdoors in a natural environment at full speed. 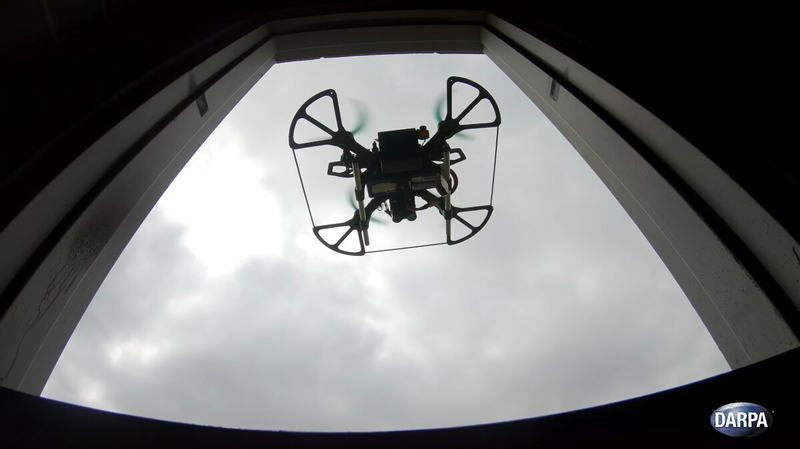 Another team pursued drone flight in an urban environment, with the drone building a semantic map of the cars and buildings it encountered, while a third team focused on navigating indoors. Taken together, the teams are demonstrating in part the way robots can do what humans do when in unfamiliar terrain, but then speed it up and transmit that information back to humans following behind. First and foremost are the military applications. If DARPA’s program results in workable code and sensors, future missions equipped with quadcopters could let the robots scout a contested area before putting any humans at risk. And that area could include dense woods, civilian-lined streets in an area that’s seen some insurgent action, or even shelled-out buildings that may be hiding snipers or other traps. The robot explores and informs, and then the humans can follow afterwards, with fresh information loaded onto their tablets and guiding their movements. There are applications for the technology beyond a shooting war. Rescue workers could use drones based on this software to see if a damaged building is safe enough to send rescuers into, or to see if there are even people alive inside who might need rescuing. Drones that can fly quickly through forests could seek out lost hikers, shifting the human energy from search to rescue. Drones that can navigate by software alone reduce the skill needed to manage the flying robots. In a pinch, the algorithm is a substitute for expertise, and far more scalable a solution. If this rocket is so ‘dumb,’ how does it ram enemy drones out of the sky? Will wiggly rotor arms strengthen cheap drone efficiency?